Find artworks, auction results, sale prices and pictures of Armando Reveron at auctions worldwide. 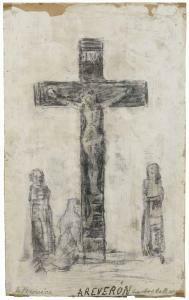 Armando Reverón (1889-1954) La Verónica (Cristo) signed 'A REVERÓN' (lower center) and inscribed 'La Verónica' (lower left), 'La Magdalena' (lower right) charcoal and tempera on newspaper 17 x 10 ¼ in. (43.2 x 26 cm.) Executed circa 1950. Provenance Anon. 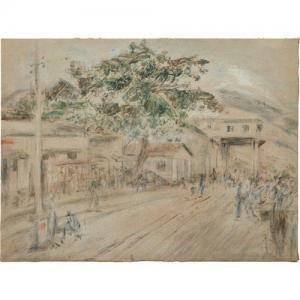 sale, Rincón de Arte, Caracas, 15 June 1970, lot 65. Acquired from the above by Janos Fenjves, Caracas. Anon. sale, Christie\’s, New York, 20 November 2013, lot 138 (by descent to from the above). Acquired from the above by the present owner. PROPERTY FROM THE ESTATE OF BERNARD CHAPPARD Armando Reverón RANCHOS Armando Reverón 1889 - 1954 Signed AReverón and dated X33(lower right) Oil on burlap 25 1/4 by 27 3/4 in. 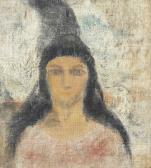 64.1 by 70.5 cm Painted in 1933. Provenance Private Collection, Caracas Sale: Christie's, New York,November 17, 1987, lot 6 Acquired at the above sale Exhibited Buenos Aires, Museo de Arte Latinoamericano-Fundación Constantini, Arte de América Latina, 2001, no. 26 Catalogue Note Ranchos by Venezuelan Armando Reverón shimmers with the spectacular light of the Caribbean landscape. 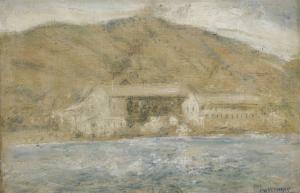 Painted in 1933, the composition belongs to Reverón\’s celebrated \“white period,\” the iconic years between 1926 and 1934 when the translucent coastal landscapes of Macuto, Venezuela emerge as a focal point of his mature production. Bordering on monochromatic abstraction and intensely tactile,Ranchos elicits a luminous immateriality. However ethereal, exposed segments of blank canvas allow texture to materialize and assume a representational function. 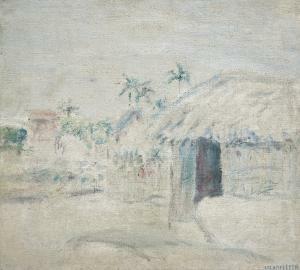 \“The Painter of White, of Silence, and of Solitude: The Mad Armando Reverón,\” as Raúl Carrasquel y Valverde famously referred to him in a article published in 1931, openly disdained \“absolutely brilliant colors of immediate effectiveness, and painted only in white, with whites, on white canvases that he prepared himself, with only faint recurrent touches of pale blue for shadows, highlights, and grand effects\” (Armando Reverón (exhibition catalogue), The Museum of Modern Art, New York, 2007, p. 125). Almost mythical in status, these rustic compositions were highly sought-after by Venezuelan society immediately upon their execution. Reintroduced to the public almost a century later at the artist\’s retrospective organized by the Museum of Modern Art in 2007,Reveron's paradisiac compositions pay homage to Latin America's rich landscape tradition.